CABP: Good morning, can your briefly describe Petro Chemical Energy, Inc.? Good morning. Petro Chemical Energy, Inc. (PCE) specializes in energy loss surveys for the refining and chemical industries. We’ve been providing Compressed Air Leak Surveys, Nitrogen Leak Surveys, Steam Leak Surveys and Steam Trap Surveys – for over twentyfive (25) years. We operate totally independent of all equipment manufacturers to ensure our clients receive a complete and unbiased report of the leaks in their facility. PCE has conducted compressed air leak surveys for hundreds of customers at thousands of sites. Undetected, compressed air and gas leaks rob efficiency in manufacturing and processing industries. As a result, businesses lose millions of dollars annually in energy costs and lost production time. Compressed air leak surveys in the petrochemical industry differ from surveys in “quiet” manufacturing or commercial industries. CABP: While you also serve manufacturing plants, PCE’s specialty is the petrochemical industry-correct? Absolutely. Petro Chemical Energy is the preferred vendor for Exxon, BASF, Dow and many others- when it comes to compressed air and gas leak surveys. In this article, we will discuss some of our case studies along with our experience in conducting air leak surveys in the petrochemical industry. Compressed air leak surveys in the petrochemical industry differ from air leak surveys in “quiet” manufacturing or commercial industries. There are always loud noises, along with many safety items, that our technicians in the field must deal with every day. You may have multiple steam leaks around a compressed air leak that you have to deal with. If you don’t know what you are looking for (or what to listen for) - you can miss leaks and get hurt in the process. If you don’t know what you are looking for (or what to listen for) - you can miss leaks and get hurt in the process. CABP: Where do you find the majority of compressed air leaks in a petrochemical facility? The majority of all compressed air leaks, in a petrochemical facility, are located in the process areas in the units where all the action is going on. There are also leaks in pipe racks between the units, just not as many. Most of the time the leaks are located at the packings, valves, holes in pipes, unions, regulators, valves left open and air traps blowing through or bypassed. PCE measures leak loss by orifice size, plume length, and line pressure. We can find leaks in areas that would be unnoticed and undetected by the human ear. We tag the leaks, document the location and size of each one in a spreadsheet, give an estimate of annual CFM and dollar loss, and provide our recommendations for repair and improvements. The challenges of working in the petrochemical industry are getting the leaks fixed. It can be a challenge to find an operator able to go around with us the whole time we are in the plant - fixing the leaks they can while we are there. Another big problem is that energy leaks at plants change on a yearly basis, sometimes even quicker. That’s why it’s good to keep in contact with the corporate energy contacts to find out who the new plant contacts are. PCE measures leak loss by orifice size, plume length, and line pressure. We can find leaks in areas that would be unnoticed and undetected by the human ear. CABP: What kind of leak detection equipment does PCE use? Our highly trained and professional staff utilizes state-of-the-art ultrasonic leak detection equipment to find compressed air and gas leaks, steam leaks and faulty steam traps. Leaks are caused by dozens, perhaps hundreds, of hard to pinpoint outflows which can be produced by vibrations and a corrosive atmosphere. Another advantage of having a plant wide ultrasonic air leak survey conducted is that when covering the plant, the ultrasonics pick up all compressed gases. We find the leak and then identify what the leak is. Most of the time it is compressed air but we also find nitrogen, hydrogen, natural gas and any other gas that is compressed in the plant. Finding the hydrocarbon leaks helps the environment and helps from a safety aspect also. CABP: What are some “Best Practices” for compressed air leak surveys you recommend? Some of the Best Practices we recommend are to make sure plants do leak surveys on an annual (or better bi-annual) basis. If you only do the survey once every four years you are going to have the same, if not more, leaks on each survey. What you want to do is see your leaks trend down each year, keeping them to a minimum. You are always going to have leaks. You just want the lowest number of leaks possible at your plant. Another Best Practice is to have your employee or local contractor (like a pipefitter or operator) go around with us and repair the leaks during the survey. We have found they can fix, right on the spot, an average of 30% of the leaks we identify! This pays for the survey and the pipefitter before we even finish the survey - saving the customer money and compressed air immediately. This creates the fastest pay back of any energy project out there. A Best Practice is to have an operator or local contractor (like a pipefitter) go around with us and repair the leaks during the survey. We have found they can fix, an average of 30% of the leaks we identify! CABP: Can you provide us some examples of the results of your leak surveys? Sure-we have quite a few! 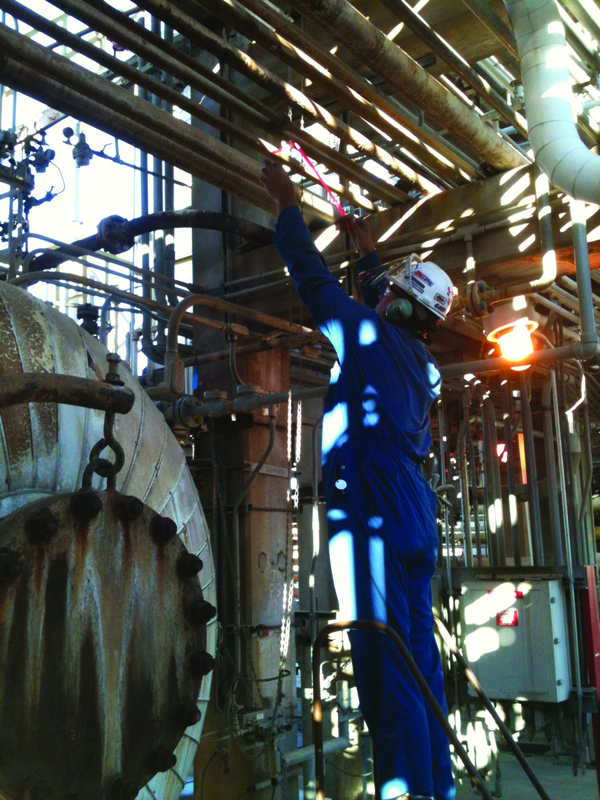 PCE performed a plant-wide compressed air & gas leak survey for a refinery in Houston, Texas. We identified 1,726 leaks resulting in the plant losing 13,424 CFM of air to leakage. After the customer repaired about 70% of the leaks, they were able to shut down three 3000 CFM air compressors. This saved the customer millions of dollars annually. PCE performed another compressed air leak survey for a petrochemical plant in Louisville, Kentucky. It was a small petrochemical plant that wanted to eliminate excess air usage. The customer was able to repair approximately 30% of the leaks we identified during the survey - resulting in a $15 to $1 payback before we left the plant. We recommended that the customer implement a yearly compressed air leak survey into its preventive maintenance program to keep their excess air usage down. In June of 2016, we conducted another compressed air leak survey for a petrochemical plant in Texas. We identified 563 leaks leaking 2,416 CFM. We called the customer back in October and asked him how the repairs were going. He said they had fixed about 70% of what we had found and they were able to shut down a 1500 CFM air compressor! This saved the company over $400,000 annually. The customer stated they were putting our survey on a PM (preventive maintenance) program every year - not only because of the results but also because they don’t want to get back in the shape they were in before our survey. Here’s one last example. 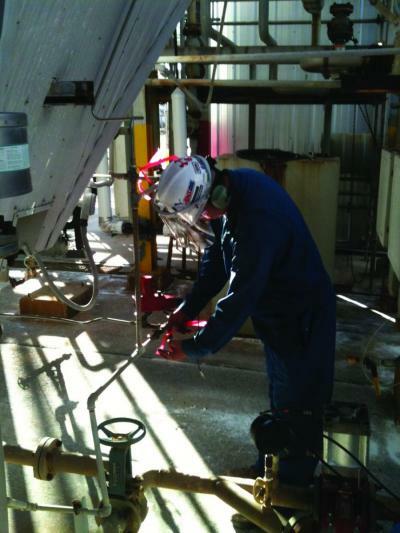 We conducted a compressed air leak survey for a customer at a small Midwestern petrochemical facility. The customer stated their air pressure had been dropping and they needed more air to run the plant. They were looking at buying another air compressor to help the pressure increase. Before they purchased the compressor, they had us out to do a survey. We found 152 leaks leaking 577 CFM of air. They fixed 88 leaks leaking 254 CFM during the survey. The customer informed us their air pressure increased by 20 PSI before we left the plant, saving them from buying a new compressor! PCE identified 1,726 leaks resulting in the plant losing 13,424 CFM of compressed air to leakage. CABP: Does PCE have multi-site contracts with individual clients? Yes. This is our bread and butter. Here’s an example of work we’ve done at six (6) locations for a petrochemical corporate account. PCE performed multiple compressed air leak surveys at these different sites and has seen an average $50,000 NET per week in annual savings for the sites we have conducted surveys for - when all leaks that could be repaired were repaired during the surveys. In five weeks at the Location 1 site, we identified $625,907 worth of leaks of which $279,891 were associated with leaks that could easily be repaired. At Location 2, we performed a partial plant survey for five weeks and identified $777,189 worth of leaks with $224,891 easily repaired. At Location 3, we performed a partial plant survey and identified $119,196 worth of leaks in one week and the Company A employee fixed $50,791. CABP: How do you structure the agreement? PCE recommends that each Company A site conduct a plant-wide compressed air and gas leak survey annually and that they provide a Company A employee to repair the easily repairable leaks identified during the performance of the survey. Immediately repairing leaks such as valve packing, tubing fittings, open valves, unions, etc., make this a Best Practice in all Company A facilities. During the survey, therefore, PCE will identify and document all compressed air and gas leaks and the Company A employee will repair any leaks that he/she can. On average, a petrochemical plant is losing 30% of the compressed air they produce and of that 30%, around 30% of the leaks can be repaired during the survey. This means you should be able to recoup an average of 10% of compressed air produced right away. CABP: That’s very impressive – and profitable for the petrochemicals. You bet. As you can see from the case studies above it is best to try and fix as many leaks as you can during the survey. It can and will result in saving your plant money, energy and unwanted down time. When customers have fixed the leaks during the surveys we have never seen a survey that was not paid for before we left the site. For more information contact: James Nipper, Vice President, Petro Chemical Energy, email: james@petrochemicalenergy.com, or visit www.petrochemicalenergy.com. To read similar articles on Compressed Air Leak Surveys visit www.airbestpractices.com/system-assessments/leaks.